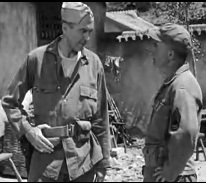 While not a team per se in all of their mutual screen appearances, James Stewart and Henry “Harry” Morgan did appear together in eight movies. They teamed or, at least, were on the same side in Thunder Bay (1953), The Glenn Miller Story (1953), Strategic Air Command (1955), and The Mountain Road (1960). In How the West Was Won (1962) and The Shootists (1976), Mr. Stewart and Mr. Morgan failed to appear in any scenes together, but Mr. Morgan did appear in scenes with John Wayne in those two movies (The Shootists being Mr. Wayne’s last film), thereby linking his character, if only tenuously, to the roles Mr. Stewart played. In the two other movies wherein the names James Stewart and Henry Morgan appear in the credits — Bend in the River (1952) and The Far Country (1954) — their characters are on opposite sides of right and wrong, Mr. Morgan’s being, of course, the wrong and ultimately dead wrong. 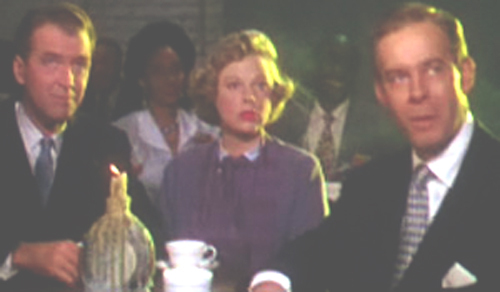 Of course, June Allyson is a defacto third member of the Stewart/Morgan team, seen here between the two in the The Glenn Miller Story. I LOVE the Glenn Miller Story! It’s was SO good! We have a picture of harry morgan outside his barracks. I also have Jimmy outside his barracks, Jimmy Stewert signed his. Kathi Fink. Very Cool! Great keepsakes from two great actors.